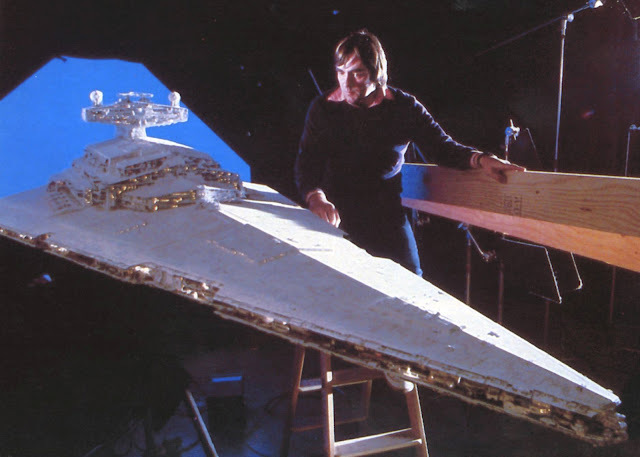 From the moment this awesome starship swamped the big screen in the opening scene of Star Wars, back in the late 70’s, I was an instant convert. To this day, I haven’t seen anything that made me feel the same way, and quite frankly, I still believe the original Star Wars sets the benchmark for all other Sci-Fi movies to follow. 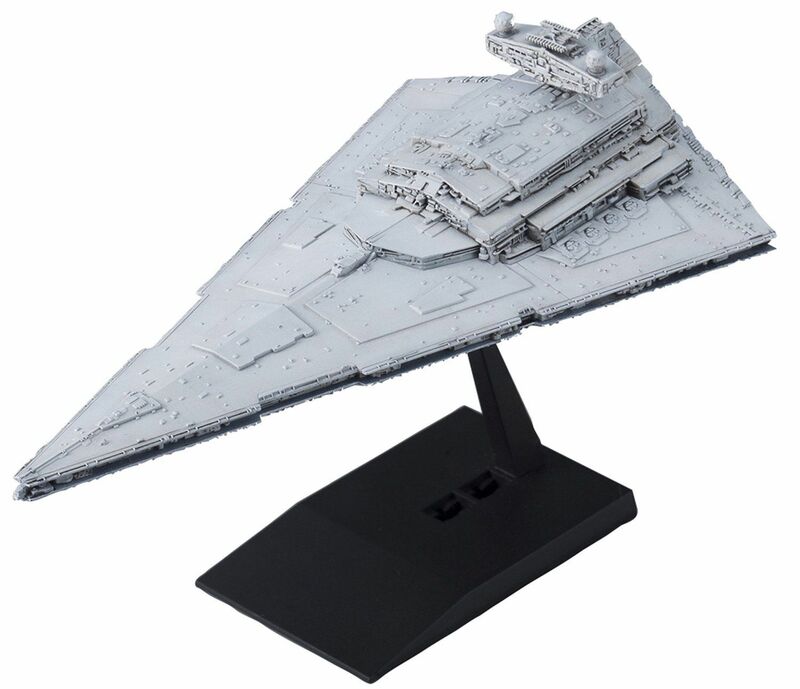 Used by both the Galactic Republic, the Empire and later on the First Order, the Star Destroyer was one of the most feared weapons in the Galaxy. 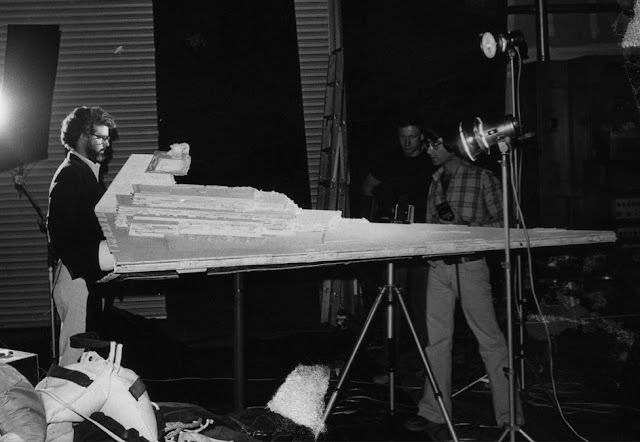 The Imperial Class measured 1,600 m long. 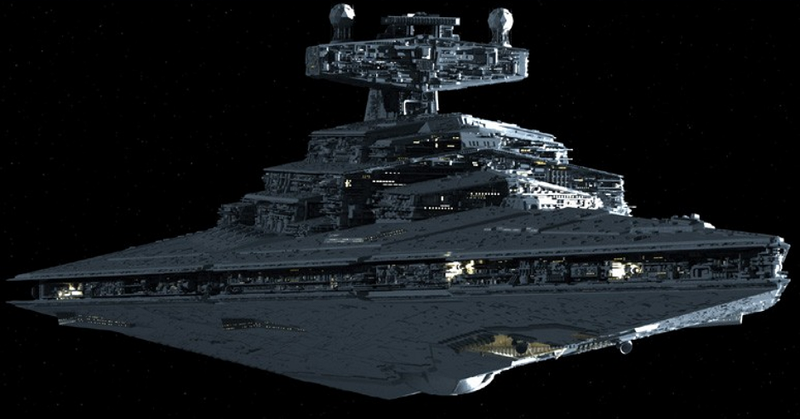 Its’ armourment consisted of; Laser cannons, Turbolaser batteries (60) and Ion cannons. 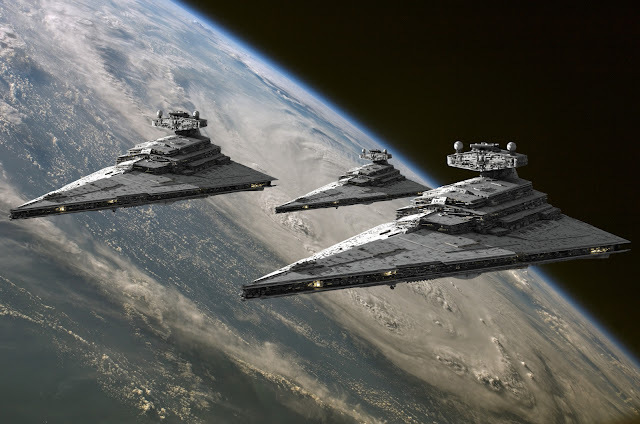 Its’ strike power was also complimented by a fleet of up to 70 TIE fighters. The ships’ crew consisted of 27850 Enlisted men, 9700 Stormtroopers and 9235 Officers. 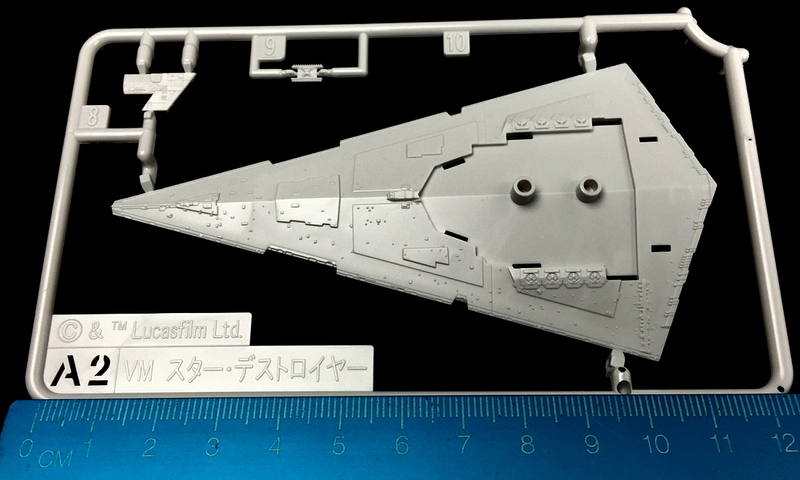 As well as this release of the mini Star Destroyer, I am aware of the X-wing, Y-Wing & TIE Fighters also being released, however, there is no common scale between these kits. 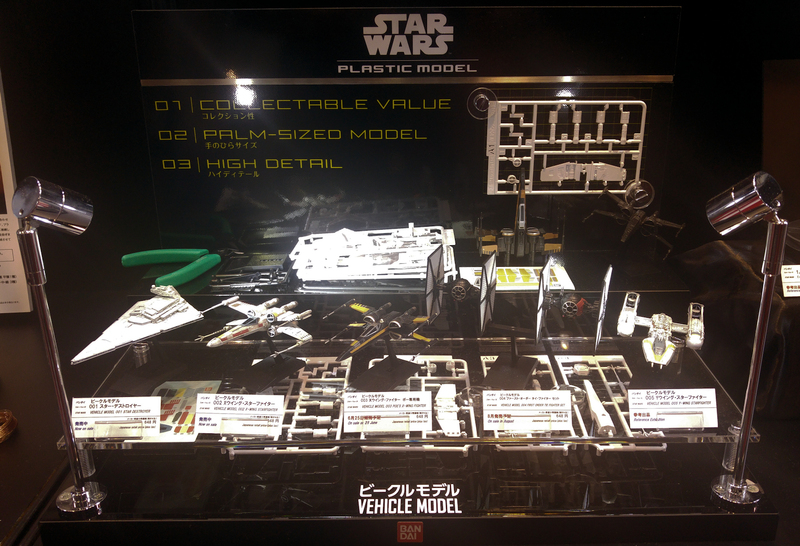 At the Bandai stand in Shizuoka model show, the whole mini-series so far is displayed. You can see the size comparisons here. 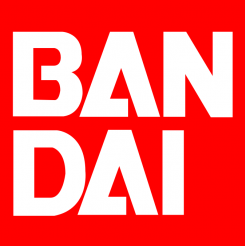 To be completely honest, if Bandai release it, and it has Star Wars logo on it, chances are, I will buy it. No questions asked. 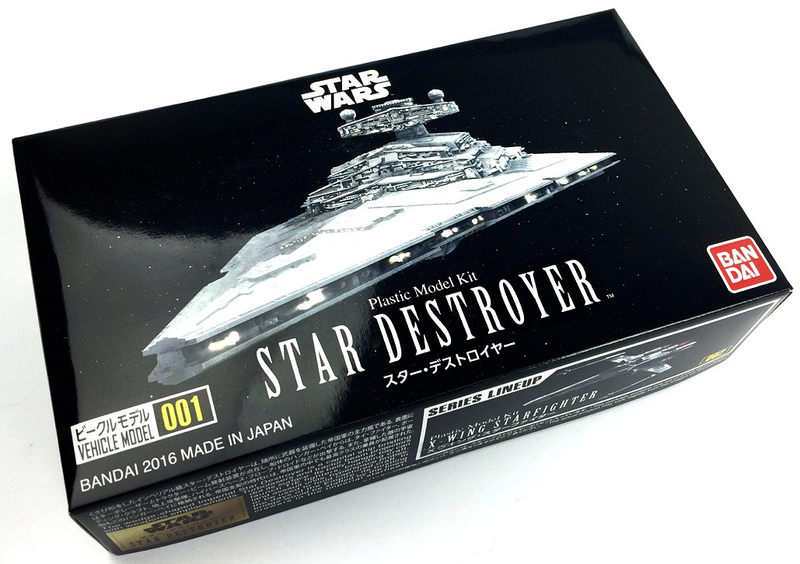 That said, the Star Destroyer is one of my favourite ships, so I was very excited to see its release. 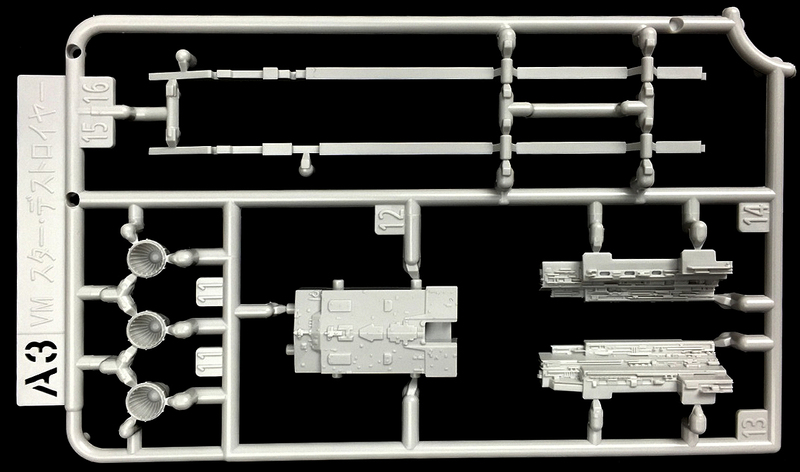 You have to understand; this is a tiny kit. 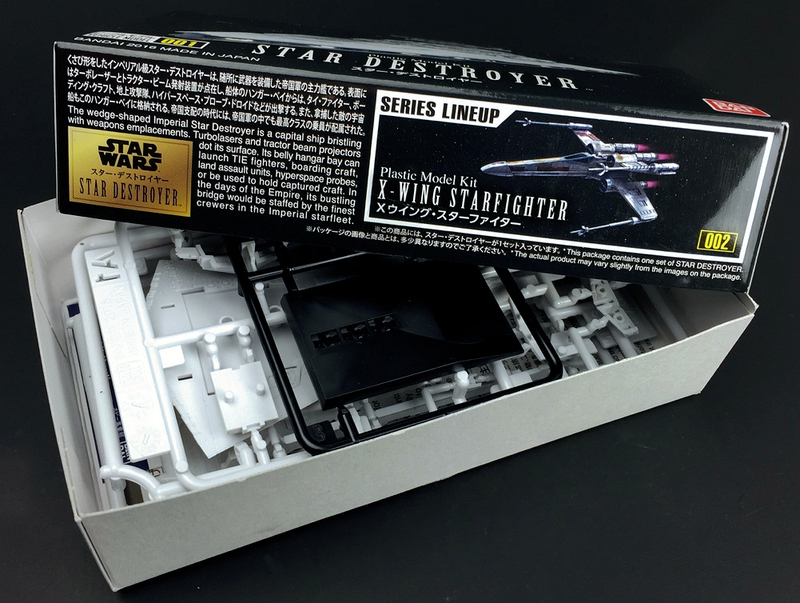 The box is small, and the model is even smaller. 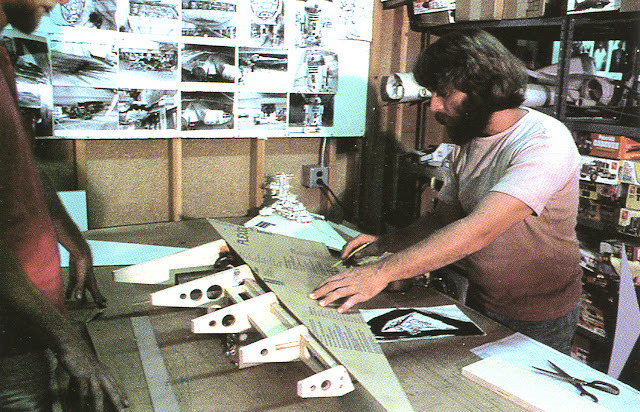 Yes, I would love a larger scale model, but you know what, I’ll take whatever I can get. 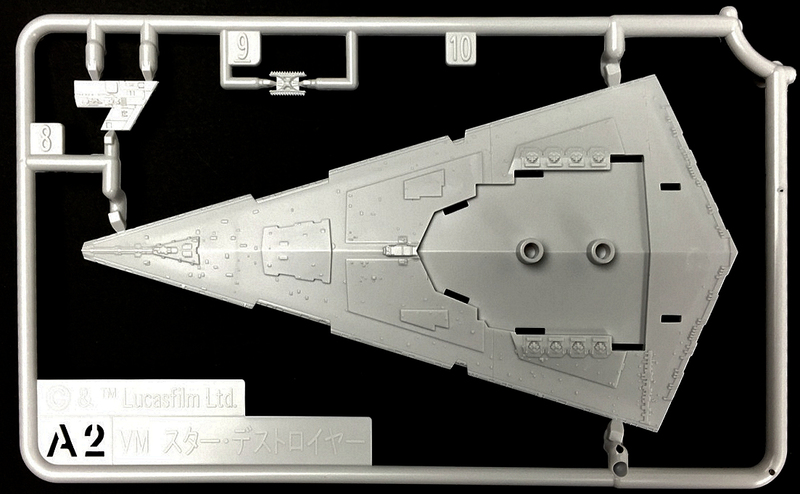 The box is small, only 150mm wide, and is of the usual high standard we have become accustomed to from Bandai. It is numbered 001 and no scale is indicated. 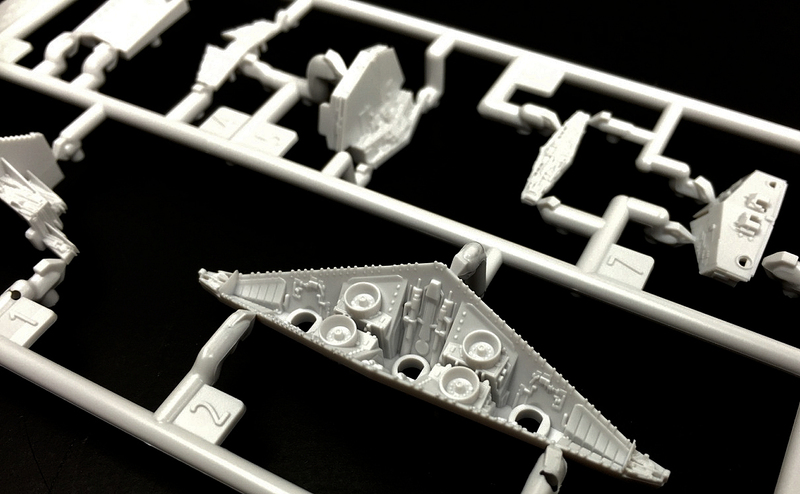 These mini kits are a new line for the SW range, so obviously there will be more on the way. 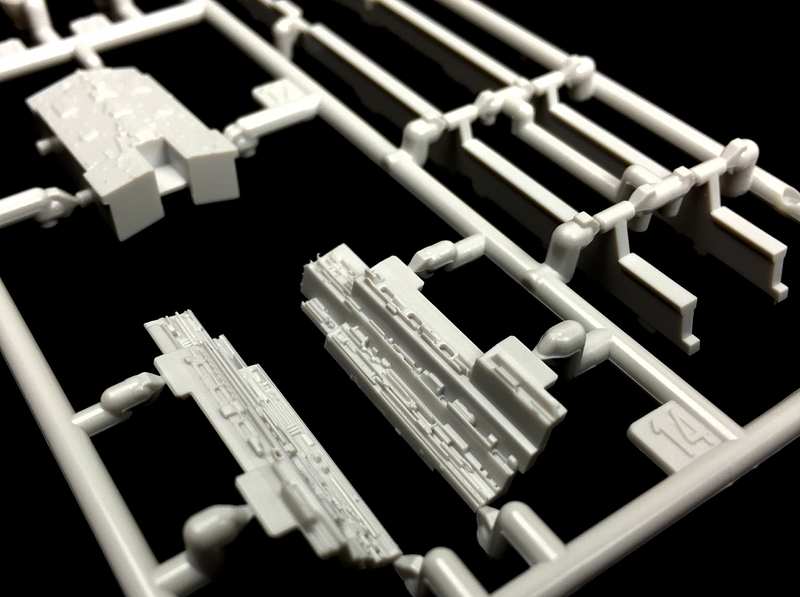 The kit only contains 25 pieces over 5 sprues, with absolutely no glue required. 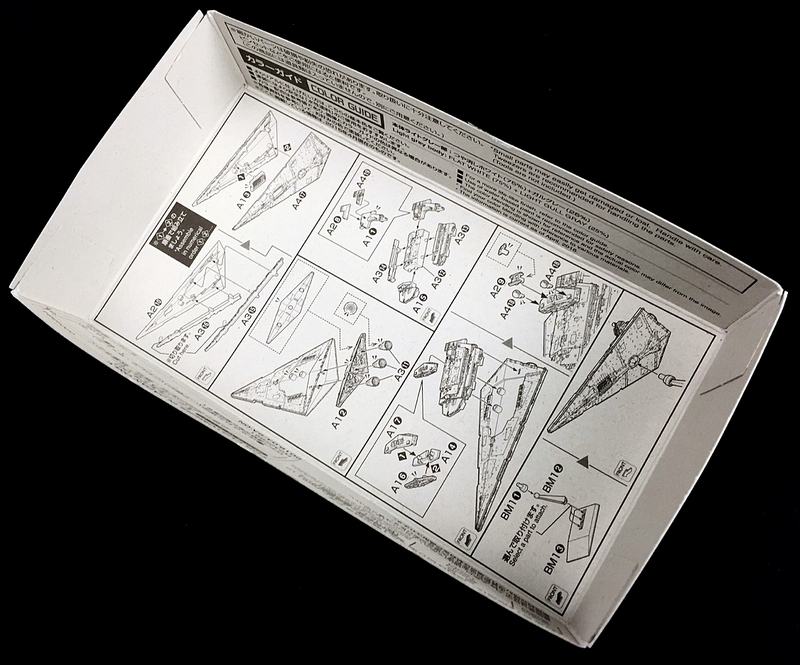 The instructions can be found printed on the inside of the box top. Very simple and straight forward. 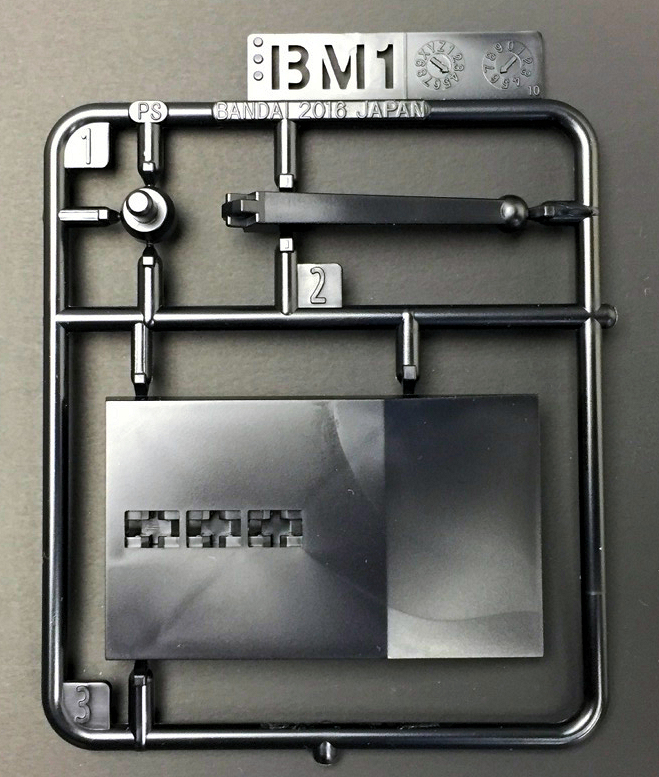 BM1 is the black moulded base section. 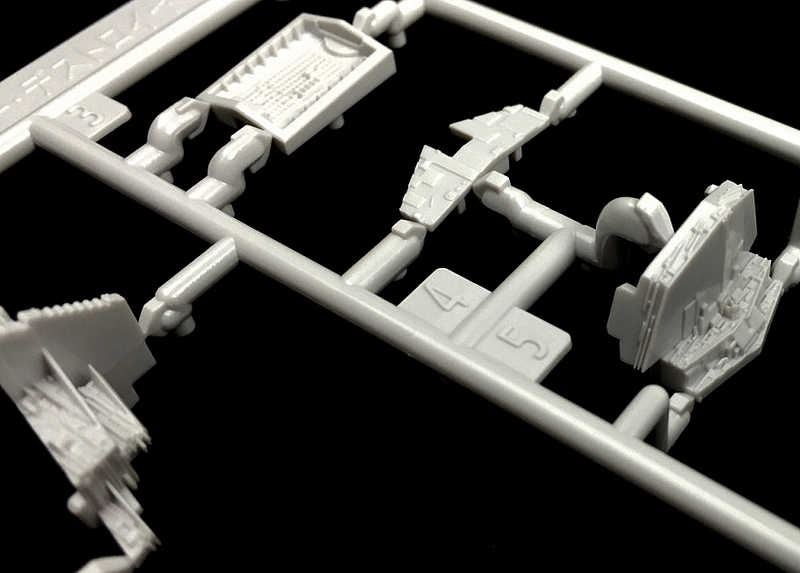 3-piece construction with a ball and socket joint enabling the model to be posed on different angles. 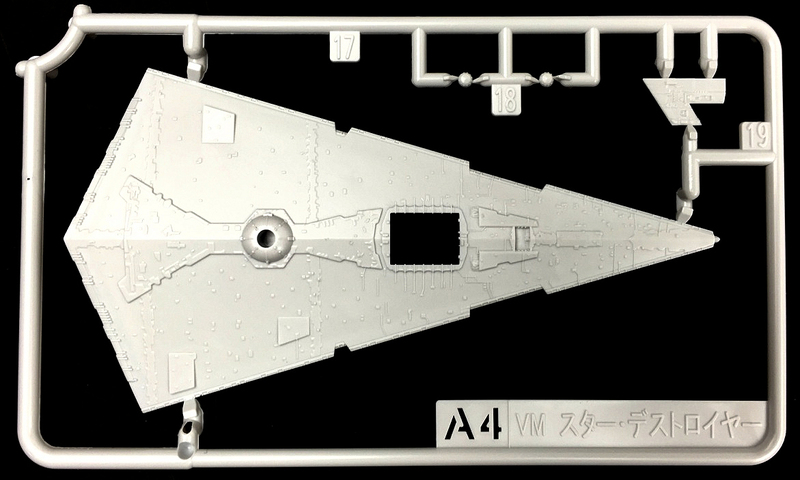 A1 contains the rear of the ship, the underside docking bay and the command bridge. Stunning, delicate detail in the pieces. Really quite mind blowing how fine and perfect it is. A2 is the top side of the ship. 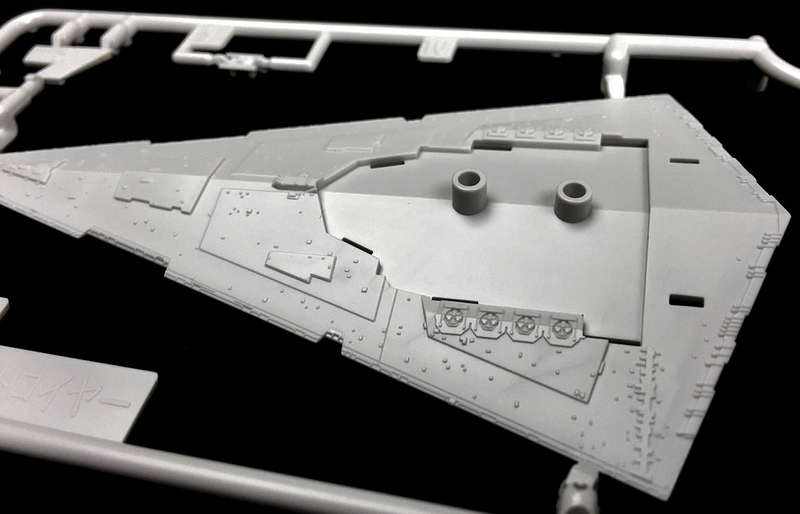 Again, the detail is stunning and construction so basic. The 8 turbo lasers are a lovely point of interest. 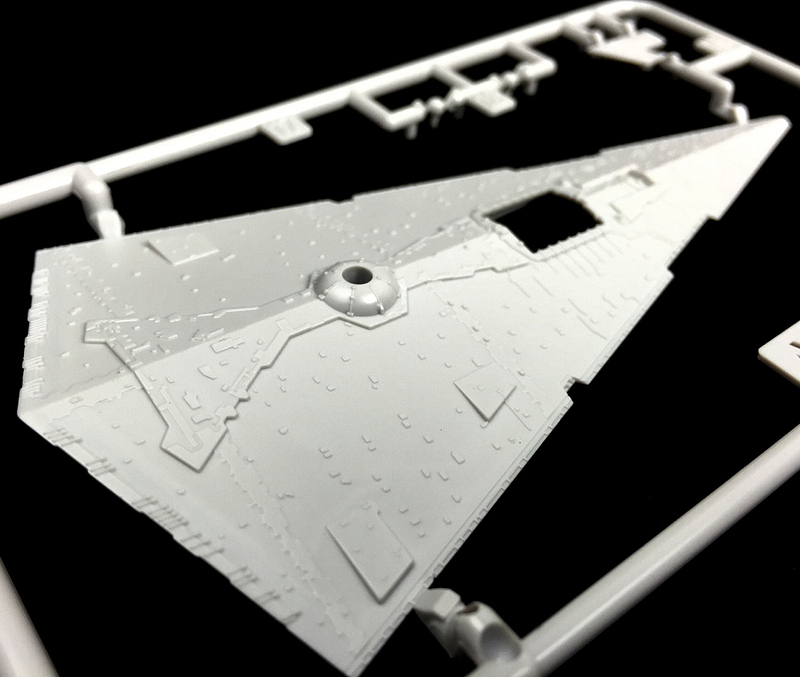 It is here you can see the finished size of this model. It is only about 110mm long. A3 contains more of the upper structure as well as the side rails. 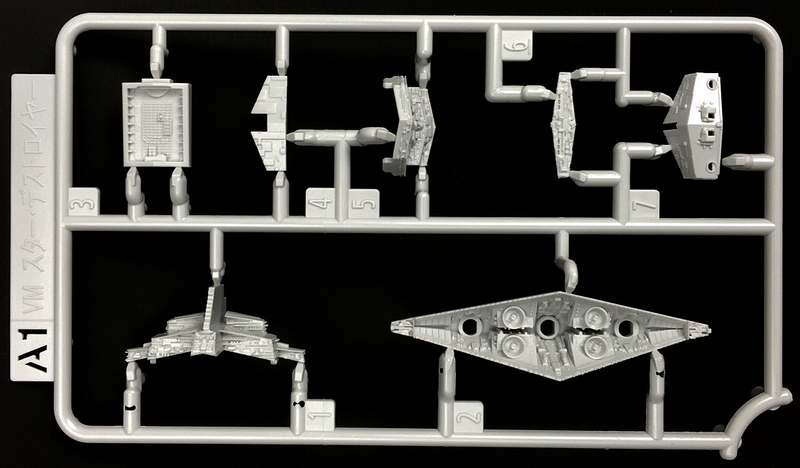 There is abundant detail through these pieces, and I can only imagine how beautiful this will look all painted up with a wash through there. Just stunning. You can see the entries to the hangers on the sides too. A tiny splash of blue paint will add some interest to the otherwise grey sides. The raised detail in the engine drives at the rear of the ship is also very nice. 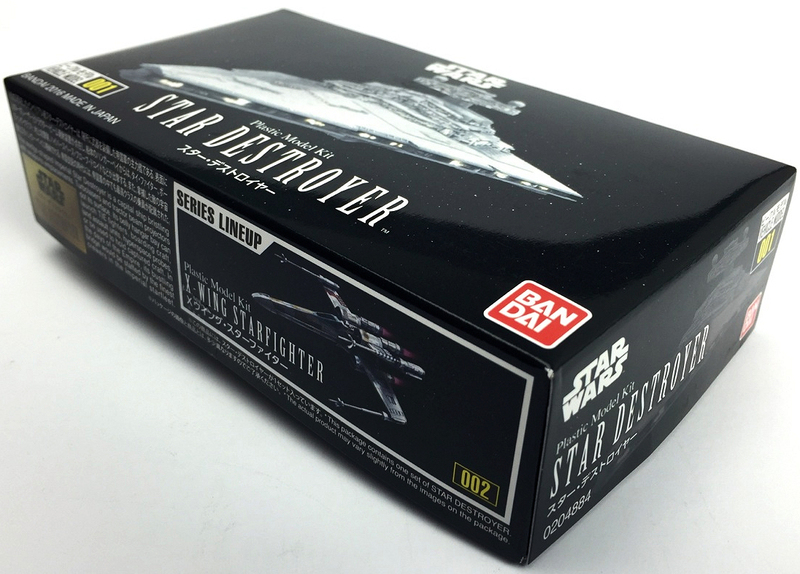 As mentioned earlier, I am a sucker for anything Star Wars, so I was going to buy this one regardless. 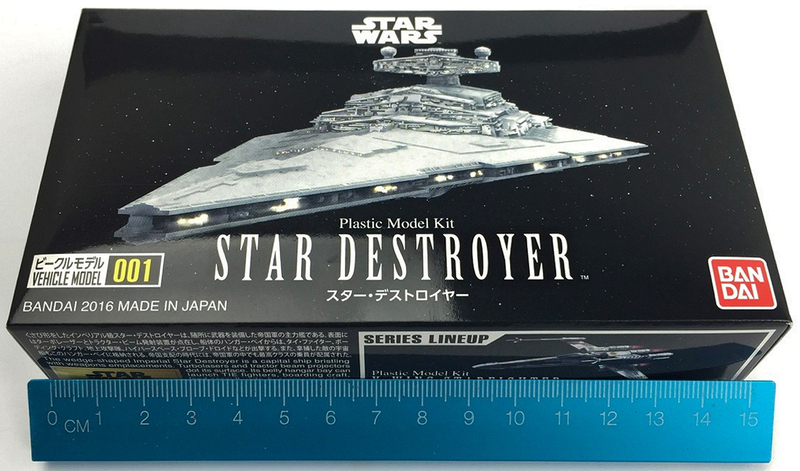 I can however, honestly say, hand on heart, I have yet to be disappointed by any of these Bandai Star Wars kits. They are simply stunning. 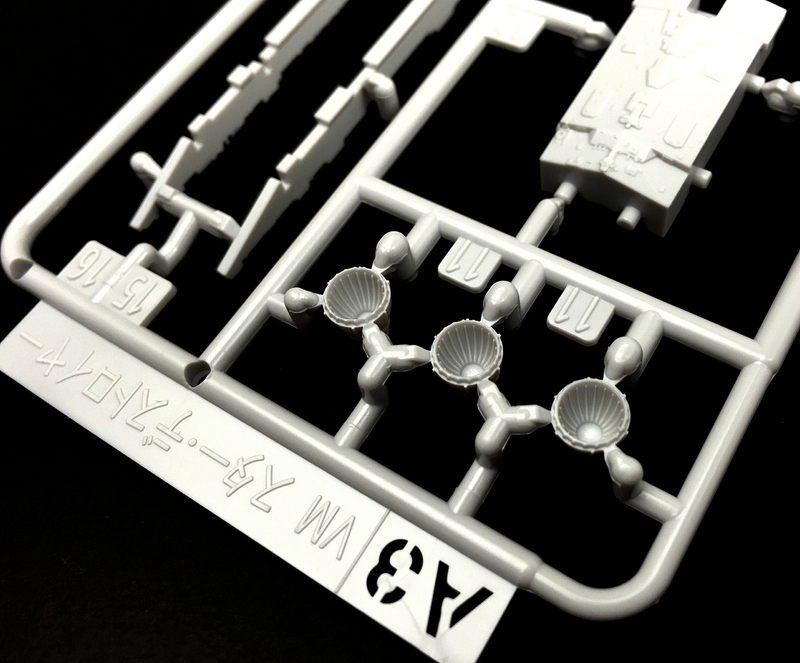 The engineering, moulding quality, packaging, value for money and the simplicity of build really set a benchmark, and make these kits attractive to just about anybody. I have actually got a couple of guys in the street I live on to these kits, and introduced them to the world of scale modelling. They are a perfect introduction to younger generations too. So, in case I wasn’t clear enough, I LOVE THIS KIT. I love all the Bandai SW range. If you see this, buy it, build it and enjoy it. 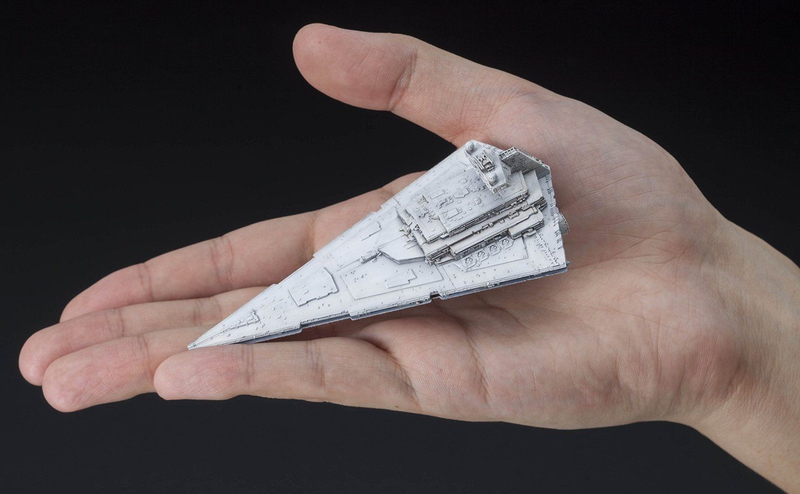 It is a gorgeous little model. It is that simple.